These smooth tracks are designed to cater to all things wheels, from drift trikes to wheelchairs! A perfect area to learn how to cycle, these tracks can range from 1m to 6 metres in width, anything is possible with these simple layouts. This is a scaled down version of a pump track, catering for ‘balance bikes’ which are suitable for very early learners. As cute as this track may seem, do not underestimate it’s lifelong teaching value. This is the progressive step from a flat track and can cater for a variety of sports depending on surface choice. This is usually the first track where users will have the opportunity to learn/understand how to control sporting equipment whilst airborne – providing them with the skills to eventually progress onto riding official Race tracks. If riders lack confidence to be airborne, this track will still provide hours of entertainment. 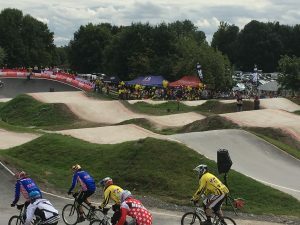 These tracks are serious creations, usually supported by a BMX Club, these tracks have their own set of regulations and can reach national standard. For any questions or work estimates for your track, contact us using the form and we will respond as soon as possible!